AIM FloraFood® contains three essential, friendly bacteria that support a healthy intestinal tract and a well-functioning digestive system. Did you know friendly bacteria can also benefit weight loss? It’s almost too good to be true. Not only do the friendly bacteria in FloraFood carry the benefits of a well-balanced digestive tract, they also may have positive influences on weight loss, according to a Japanese research team. In their novel study, the Japanese group of researchers focused on the anti-obesity effects of lactobacillus gasseri, one of the three friendly bacteria—along with Bifidobacterium bifidum and Bifidobacterium longum—found in FloraFood. The results, published in the European Journal of Clinical Nutrition, were striking. Eighty-seven individuals with high Body Mass Index (BMI) scores and increased abdominal fat were split into two groups. One received milk fortified with the probiotic, lactobacillus gasseri and the other received milk with no probiotic fortification. After twelve weeks, the probiotic group showed a decrease in abdominal fat and subcutaneous fat by an average of 4.6 percent and 3.3 percent, respectively. In addition, the probiotic group showed decreases in weight, waist circumference, and hip circumference. Among the group that did not receive the probiotic, no significant differences were noted. The metabolic effect of lactobacillus gasseri was clearly evident in this study. Researchers believe that lactobacillus gasseri’s impact on weight loss may be due to its intestinal anti-inflammatory properties and its maintenance of a healthy digestive system, two factors that can contribute to preventing body fat. 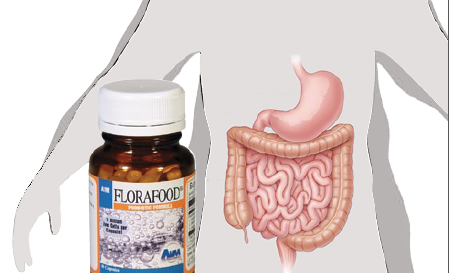 Digestive health has always been a calling card for FloraFood. The combination of lactobacilli and bifidobacteria counteracts the unfriendly bacteria in the gut, aids in the digestion of lactose and protein, cleans the intestinal tract, and purifies the colon. The benefits of friendly bacteria extend even to immune response, vitamin production, healthy cholesterol and triglyceride levels, and protection against toxins. You can add weight loss to the list also. Consider adding FloraFood to your healthy weight regimen, and get the most from your friendly bacteria. With one billion friendly bacteria in each capsule, FloraFood has you covered for digestive health, weight loss, and so much more. What an incredible start it has been for Dr. Joseph Vetere, an AIM Director from Carmel, New York. After signing up as a Member in June, Dr. Vetere reached the Director level three months later, signing up 24 new Members in his first 90 days. His astonishing growth has come as a result of simple sharing as opposed to a hard-and-fast business plan. and his own chiropractic practice for 15 years, takes a holistic view on restoring health, focusing on dietary changes, rest, water, eliminations, proper supplementation, and chiropractic care. Participants in the wellness program become AIM Members in order to integrate the AIM products into their health plan. 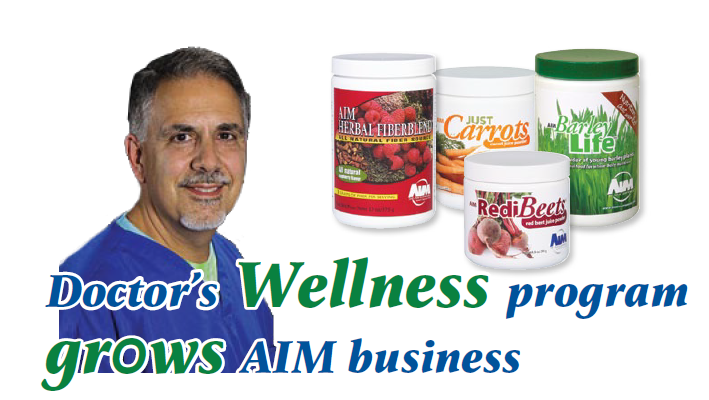 The foundational supplements for Dr. Vetere and his program include AIM BarleyLife®, AIM Just Carrots®, and AIM RediBeets® (the AIM Garden Trio®) and AIM Herbal Fiberblend®. Nutrition has always been a key component in Dr. Vetere’s health and that of his patients. Prior to joining AIM, he manufactured and sold his own line of nutritional supplements and had looked into the possibility of expanding his line into the network marketing industry. When that plan proved unworkable, Dr. Vetere sought an existing health company to join, and after researching the top health companies, he decided on AIM. Dr. Vetere keeps the Garden Trio and Herbal Fiberblend by his desk at all times, and he takes AIM PrepZymes®, AIMega®, and AIM GinkgoSense™. 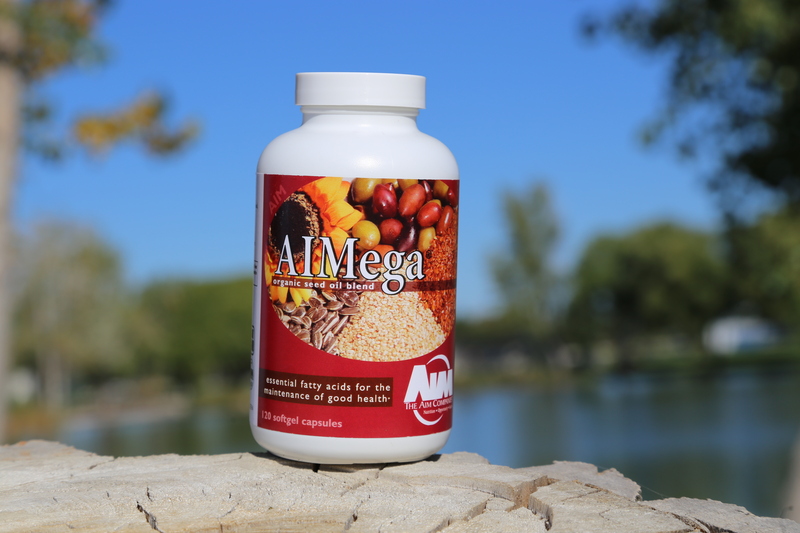 The health boost from AIM’s elite supplements have been noticeable from the start. “When I first took BarleyLife,” Dr. Vetere said, “you get a rush, man. It’s not an energy boost like caffeine; it’s different. It’s better. The only way I can describe it is that you have this heightened sense of agility. You become more aware, more sharp, more vibrant, more alive. “If you eat right, put your problems in the hands of the Lord, realize how small they are, have the proper nutrition, and follow the seven weeks to wellness, I believe that is the key to good health.” And sharing this wellness plan with others has been key to a booming AIM business. Even the simplest weight loss plans are possible with desire and determination. With her husband facing heart health challenges, AIM Director Masako Moriyama from Abbotsford, British Columbia, got serious about altering their diet— removing processed foods and unwholesome grains and sugars and replacing them with fruits, vegetables, and AIM nutrition. This simple change in diet was the impetus for getting their health back on track. Masako’s plan (see sidebar) included consistent use of AIM powder concentrates like AIM’s BarleyLife®, LeafGreens™, Herbal Fiberblend®, and ProPeas™ as well as an increase in fruits and vegetables and a decrease in unhealthy foods. The end result: Masako lost 20 pounds in six months and went from a size 12 to a size 8. The assist from the AIM products was substantial, and Masako’s combination of products—greens, fiber, and protein—proved ideal for her weight loss goals. The nutrient-rich greens in BarleyLife and LeafGreens have an alkalizing effect on the body, which can help create a toxin-free environment. Fiber supports a healthy digestive system, and it partners with protein to boost satiety and curb appetite. When combined with a healthy diet of whole foods, fruits, and vegetables, not to mention the removal of processed foods and glutenous wheat, the AIM products help form a complete, simple diet plan. 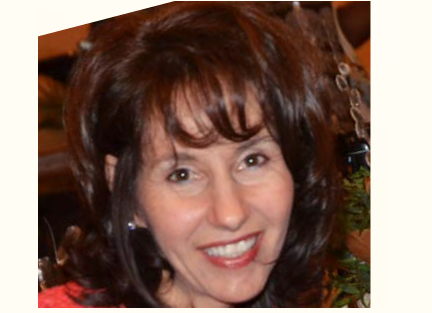 Even the small changes can yield big dividends, as Masako discovered, and her plan is possible for anyone. “You can do it, too!” Masako said. “Wheat is addictive, don’t eat it. Choose to eat better. God gave you a body to take care of, and it is your responsibility to keep it well. You can be the creator of your own healthy body. It just takes discipline, encouragement, diligence, and most of all, commitment. 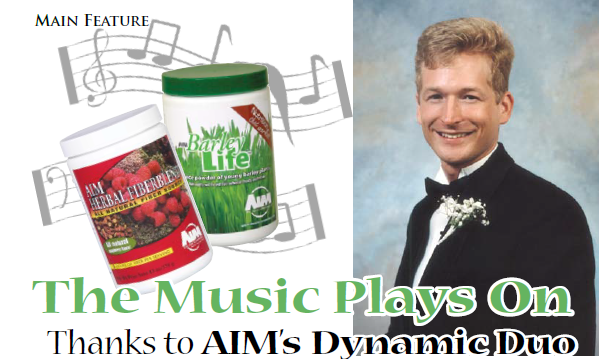 AIM’s Dynamic Duo—AIM BarleyLife® and AIM Herbal Fiberblend®—made a dynamic difference in the life of Stephen Distad. In 1987, at the age of twenty-three, Stephen faced a bright future in the music industry, pursuing a master’s degree in organ church music at Baylor University. Those dreams appeared as if they would be derailed. Stephen developed a severe case of rheumatoid arthritis, and it cast a cloud on his future in music. Tests at the Mayo Clinic confirmed Stephen’s greatest fear: The severity of his arthritis would be too great to continue with his music studies. According to the clinic’s physician’s, Stephen would eventually be resigned to a wheelchair, and he would have to change careers. Throughout his life, he sought natural remedies for his arthritis, including a therapy with bee stings that gained notoriety in a local paper. The article caught the attention of AIM Member Douglas Waters, who went to the Distad residence in Waco with a jar of AIM green barley powder. Stephen took the powder for a week and noticed a considerable boost in energy. The following spring, Stephen began taking AIM Herbal Fiberblend® to cleanse his body. These two products—the dynamic duo of greens and fiber—made a profound difference on his health. One year later, tests conducted at the Mayo Clinic confirmed that Stephen was arthritis-free. A confirmation letter from the clinic revealed that no other patients had overcome rheumatoid arthritis as severe as Stephen’s. The best treatment was to mask the side effects while the condition worsened. Stephen embraced this new lease on life wholeheartedly. He completed his master’s degree program at Baylor. Quickly, his services came into high demand. He performed concerts in every European country, including Coventry Cathedral in England. He received a scholarship from the French government to study in Paris for one year. He performed at famed locations in New York, St. Patrick’s Cathedral and St. Thomas Church. Currently, Stephen is an organist at Houston’s Memorial Drive United Methodist Church, where he plays for a congregation of 7,500. He also maintains a role as concert pianist. Living the life he had always dreamed was made possible through hard work, determination, and the gift of health with AIM. We thank Stephen’s mom, Verna Distad, AIM Director from Brownstown, Pennsylvania, for sharing this great story of the gift of health.